We have been in operation for over 100 years. Ivan started helping his father, Melvin, when he was too little to do much. His dad tied him on a horse with his belt to keep him out of everyone’s way. When Melvin operated the orchard he drilled trees with an auger operated by hand, collected the sugar water in buckets and carried those buckets by horse to the sugar house. He would only make about 10 gallons of syrup a day, which was very good in that era. Ivan helped his father until he married his wife, Sis. They decided to purchase the maple syrup business from Melvin in 1959. They immediately set out to make substantial changes. Their main focus was on increasing production. Ivan and Sis built a new sugar house and began using a tractor to tow barrels of sugar water back to the sugar house. They went from 250 buckets collected each day to about 1,000. It took eight men most of the night to collect all of the water. Ivan had an idea that would change his maple syrup production. He began using plastic tubing rather than buckets to collect the maple sugar water. The first year they connected about half of the trees with plastic tubing and were able to see how well it worked. The following year they went to all plastic tubing and collected water by the flow of gravity. At that time, Ivan had only one evaporator but soon bought another. Sis and the kids ran the dairy production and were milking about 50 cows. They decided to sell the cows and cease dairy production. Ivan got a big idea and told Sis he was going to hook up the milking machine, used from the dairy, to the trees. Everyone joked about the idea and thought he’d lost his mind. Ivan was determined to see if it would work. The milking machine could typically milk from four to eight cows at one time, but when he connected it to the trees it was effectively milking 800 trees at once. By the end of the year, he cut eight men from his labor force and upped the production by 25%. The company who made the milking machine asked Ivan’s permission to publish a story about this in a publication for the dairy industry. People came all over the country to visit and see what he’d done. In 1980, Ivan and Sis added another innovation, the reverse osmosis machine. It would help keep the concentrated sugar water and throw away the purified water. The machine took out about 35 gallons of water of the original 50 gallons of sugar water. That would save him time in cooking the water down. About 30 gallons of syrup is made per hour compared to 10 gallons made a day when his father made syrup many years ago. They soon out grew the production of their own 800 trees and started leasing more trees from other farms. They tap over 2,000 trees with over 11,000 taps. 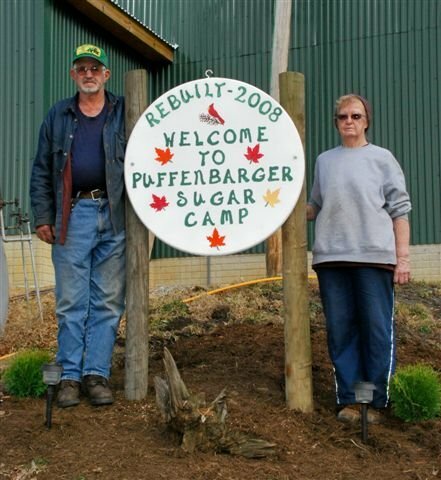 Puffenbarger’s Sugar Orchard would like to extend an invitation to visit our sugar camp during the Highland County Maple Festival, the 2nd and 3rd weekends in March. Weather permitting you can see the processing of sugar water by using a vacuum gathering system, reverse osmosis machine and an oil-fired evaporator. Depending on the sugar content, it usually takes about 50 gallons or more of sugar water to make one gallon of maple syrup. Ideal conditions for syrup production are nighttime temperatures below freezing and daytime temperatures rising between 40 or 50 degrees. The syrup producing season usually ends by the end of March. We usually have syrup year round and will ship containers to any location in the USA via UPS.